It is the day before Christmas eve, and I will soon be going downstairs to carve up apples for pies. Here’s wishing you dear readers, a very Merry Christmas, or Happy Holidays as the case may be, and the best to all in 2017. Don’t let the door hit you in the arse on the way out 2016. I think we will all be glad to be done with you. So rather than go into a researched account of things past, or detailed description of some refinishing procedure, I am simply going to show you four of my favourite pieces in our collection, whose maker is unknown, and talk a bit about them. I think it will be fun, and I will be able to get to the kitchen quicker. Much folk art is unsigned. 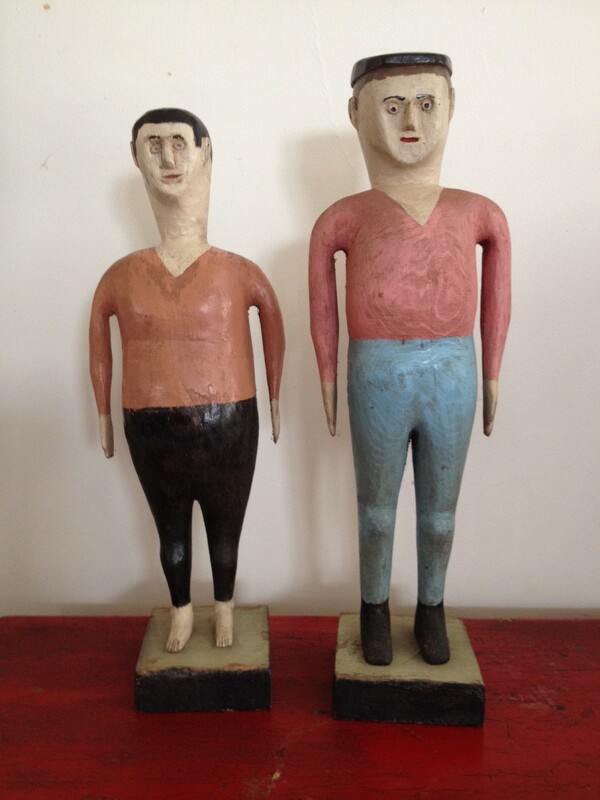 Many who make folk art do so for their own gratification and therefore don’t bother to sign. Others are perhaps unsure as to whether they want to own up to it. For whatever reason, it can be frustrating to a collector when you come across something you really like, and then can find no clues as to how to find other pieces by the same hand. Sometimes you continue to find pieces you recognize are by the same maker in the same places, so you know you are getting close, and eventually you may be in the right place at the right time to have someone tell you who made them. Other times you may find a piece which totally blows you away, and never, ever see another piece like it. Walking around the house I have chosen these four pieces for your consideration. 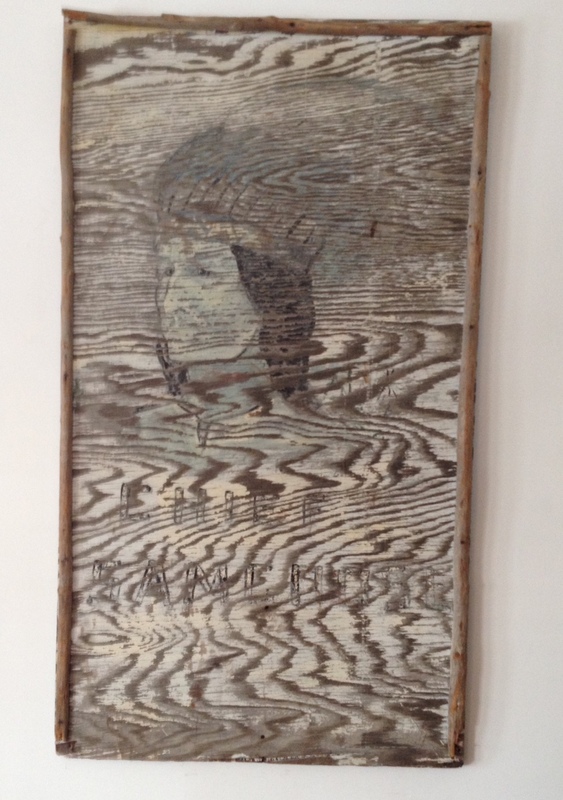 We came across this unsigned piece on the second floor of Alan Chauvette’s pickers barn in St. Valere Quebec, in about 1985. I remember the excitement I felt as I pulled it out from underneath a pile of blankets, and immediately fell in love. 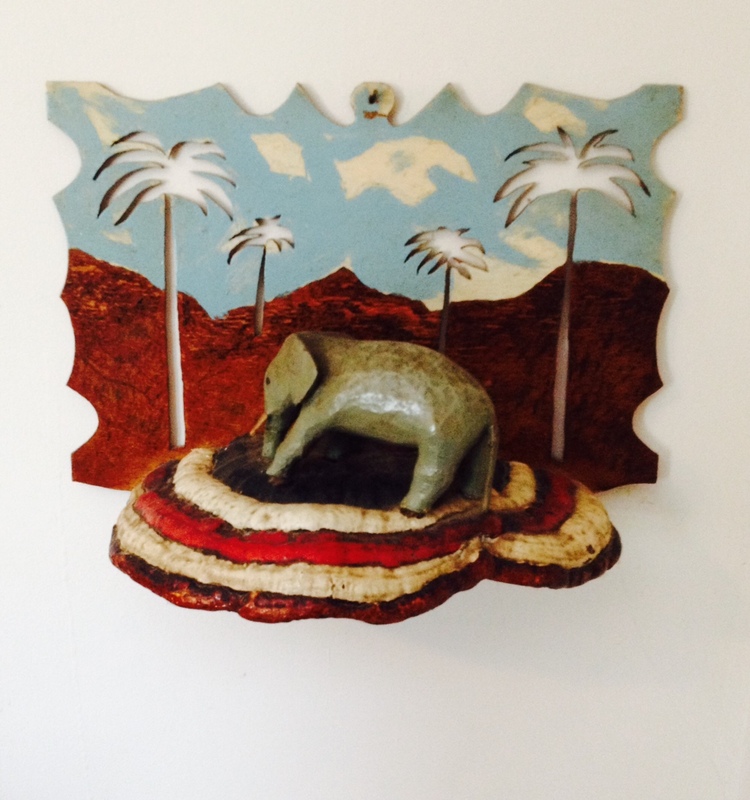 Obviously local, the creator was dreaming of exotic, far-off Africa, with palm trees carved in relief against a blue sky. I have always had a thing for the tree fungus you come across in the woods, which seem to scream out “do something with me”, and after finding lots of pieces involving fungus, I realize that there are many who share my enthusiasm. For a while there I collected fungus folk art. That was before Jeanine expressed that she found many of the pieces ugly, and she developed a theory that they may be releasing spores into our environment, so she would prefer that I move on. This piece however, because she loves it as much as I do, and because the fungus is painted clearly falls into a different category. I cannot logically explain why this piece falls into as Chuck Heston so famously put it, “if you want it, you’ll have to wrench it out of my cold, dead, hands”. But it truly delights me every time I look at it. Again, it was love at first site. This time it was in the early nineties and I was having a quick look around the Inside/Outside show held near the Toronto airport before the crowd was let in. I came across these fellows in the booth of Cathy Constantino, of Timber River Farms. Cathy is a sweet woman and you can always count on her giving you a good deal so I simply asked for her best price. She knew they were very good, but she gave me a reasonable price in any case based on her purchase price, which makes Cathy a “class act” in my books. I put them in my case and didn’t show them to anyone for fear they would offer me “stupid” money, and I may be tempted by the bottom line. You can’t eat art, but you can’t live without it either. She actually did have the name of the artist, which I actually did write down in my day book which is how I kept track of everything in those days, but it would take me hours to go through those books to retrieve it now, and as I mentioned I am anxious to make pies. I will do it one day, and write it on a note underneath them but these fall into the category of “I never found another piece by the same artist.” So, it can wait. Aren’t they just the greatest figures of manhood that you can possibly imagine. They hit all my buttons. Last, but not least, we have a couple of Magpies facing down each other over a worm (missing). We acquired this at last spring’s Aberfoyle show, from the booth of Craig Gamache. 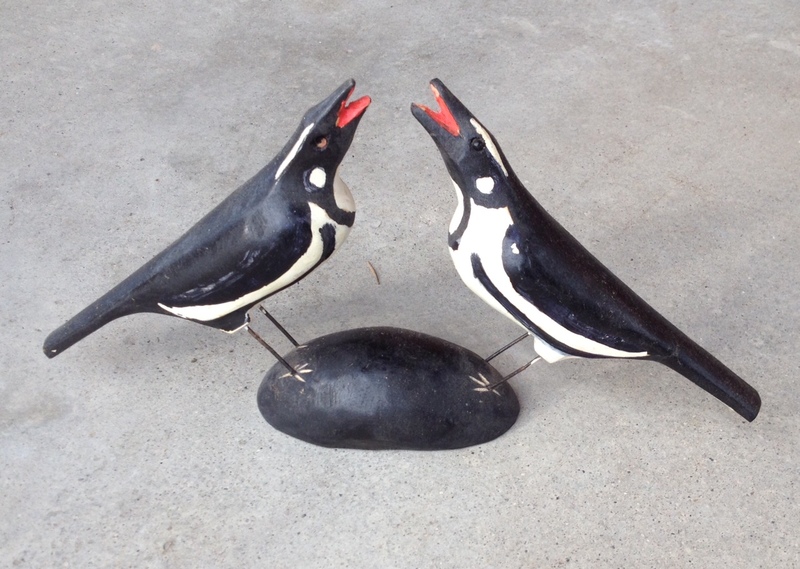 Jeanine has a large collection of bird carvings, and we knew right away that these fellows would have to be added, so it was with some relief that he offered them to us at a decent wholesale price. He had no information on the artist but mentioned that there had been a twig, looking like a worm, between their beaks when he bought them; but the worm was broken when he found it, and had become lost. One of these days I’ll get around to putting a new worm between them so the tug of war can continue, but in the meantime, it just looks like they are having an animated conversation. As Magpies will do.